A MISSISSIPPI REPUBLICAN who drew scorn for making racially insensitive comments held her US Senate seat in the final race of 2018, networks projected, avoiding what could have been an embarrassing setback for President Donald Trump. 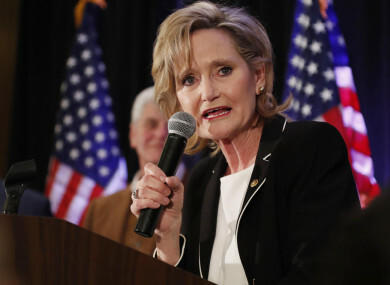 Trump held a pair of 11th-hour campaign rallies in Mississippi to prop up Hyde-Smith’s campaign, which had nearly derailed due to her remarks that Espy and others criticised as racist and undemocratic. But she startled observers this month when she said she would be “on the front row” if one of her supporters “invited me to a public hanging”. He and Hyde-Smith entered a runoff because neither gained a majority in the 6 November election, which featured multiple candidates. Email “Republican who said she would attend 'public hanging' and suppress liberal votes wins US senate vote”. Feedback on “Republican who said she would attend 'public hanging' and suppress liberal votes wins US senate vote”.